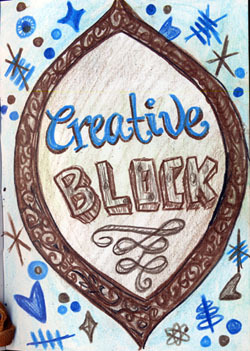 Ah yes… the creative block. Usually there are ideas pouring out but lately… nuthin’. I’ve been making a mess with glitter… putting in on anything that isn’t nailed down. Does that count as “creating” something? 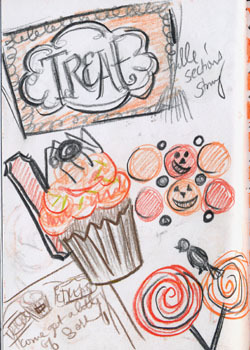 Well, high up on my “to do” list is the Halloween postcard. This is Violets are Blue’s 5th Halloween. It’s so hard to believe it’s been that long! 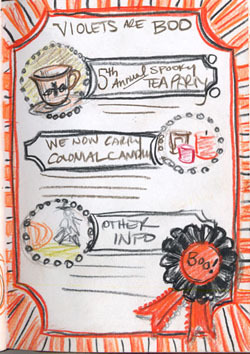 So, I can proudly write “Our 5th annual Spooky Halloween Tea Party” on this postcard. I think I’ll combine the three somehow and add pictures. I wish I could glitter all almost 2000 postcards that need to go out ;) But what I am thinking of doing is spraying the postcards with pumpkin pie scent… I need to figure that one out. I’m a box un-packing machine! We’ll be having a GIVEAWAY any day now… definitely a candle or twelve…that and perhaps a Webkinz and something Halloweenie… to get in the spirit! I’m supposed to be assembling some sort of post card and mail it out for the shop’s 5th annual Halloween party… but I can’t think of anything to take a picture of or draw. I think the cold and large amounts of Robitussin have killed my inner artist! Temporarily, at least. I need inspiration… the 300 pounds of Pumpkin Pie Candles just aren’t doing it. I’m waiting for glue to dry… literally… so I thought I would share this last week’s adventures in owning a store with you. So, Nathan is working on a project for an awesome non-profit organization in Durham, North Carolina. He had planned on flying out to NC to attend some meetings. I thought I could tag along for a beach cottage rental weekend and a week of hanging out with my friends and cousin. Yippee! End of Summer fun. Well, the day we are supposed to catch a flight, a long, snake-like lizard decided to come into the store and start shopping. This was about 4 hours before we needed to be at the airport and I was freaking out. Big time. I’m scared to death of slinky things and it was IN the store!!!!! Of all the days and all the things… great timing. So, I’m trying to keep tabs on him and then at one point, I see his little head pop out from behind a desk. Since I would be frantically waving a broom on one side, how would I know that he got out of the propped-open door? I turned my cell phone on to video and set it by the door to capture his escape. Unfortunately, the cell phone didn’t capture anything (I would have won money on America’s funniest home videos) and the lizard came running towards ME. Apparently, they aren’t smart enough to turn around, they go the way they are pointed. So, he’s now running towards the check-out counter and I have him cornered. Oh boy. The door opens. Perfect timing for a customer, right? It was my neighbor’s brother!!!! He scooped up the lizard and released him into the wild streets of La Crescenta, well, the bushes actually. So, disaster averted. With about 2 hours of the day remaining, I figured i needed to cut checks, including rent. Crap. I’m completely out of checks. Order more… fastest they can be here is 5 days. Doesn’t help. I pay what I can with credit cards and head home to start packing (duh! we never run this late!). It was crazy getting to the airport. The beach was amazing, we swam for hours. Had North Carolina BBQ three days in a row… yay. Meanwhile, at the store, my friend who was opening for me was sick and had to close saturday. Coast to coast cooties! I woke up in a fog this morning and got on my cell phone to pay more bills and make some calls…cell phone turned off. I forgot to pay the bill. There are a few other things that happened, too… but I’m pretending that they don’t exist. I guess this is just “life” :) right? Is it feed a cold, starve a fever? 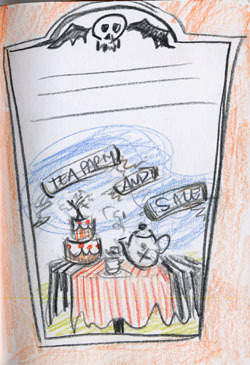 I’m going to go make some tea now :) I’ve decided I can never go out of town again… too much chaos.